The Marine Corps’ seven Marine Expeditionary Units are designed to deploy at a moment’s notice for combat or emergency response, but it seems two of the MEUs have been waging a war a little closer to home. The 15th MEU, out of Camp Pendleton, Calif., has had an official account on Twitter for over a year, tweeting a regular stream of Marine Corps news and photos. 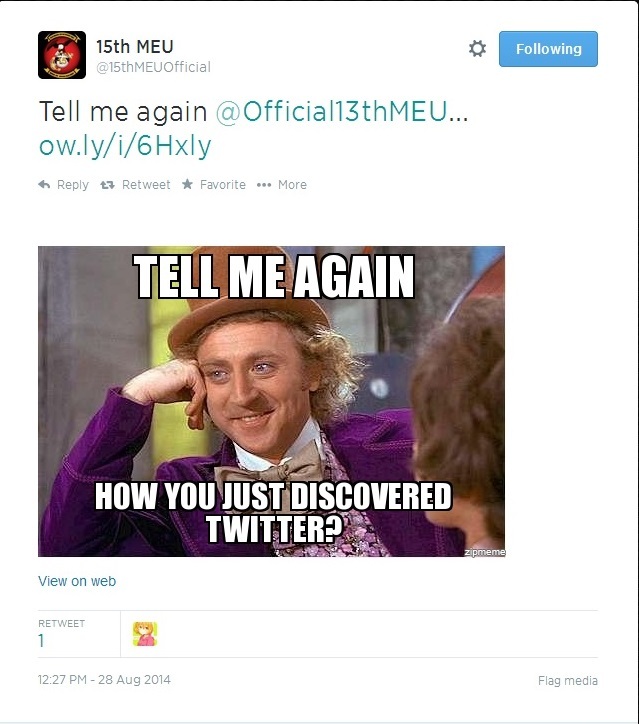 But when its neighboring 13th MEU joined Twitter in July, things started heating up. 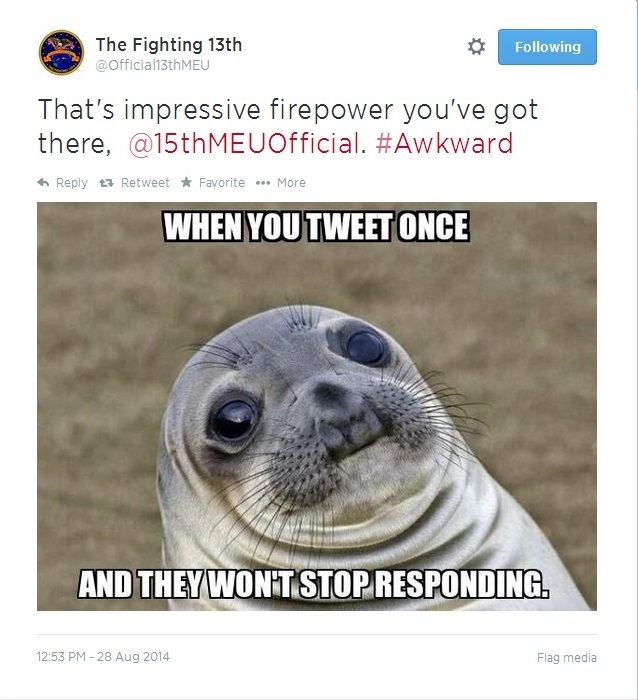 On Aug. 23, the 13th MEU account issued a friendly shout-out to all the MEUs on Twitter. Chesty Puller, the patron saint of Marines, was invoked. Typically, the Marine Corps presence on social media is formal to a fault, so I inquired with the MEUs to see what was behind this highly entertaining Twitter feud. I asked him if there was a standing rivalry between the 13th and 15th MEUs, Red Sox-Yankees style. “Any opportunity to dig the cousin to show them that you’re better,” Block said. But, he said, rivalry was all relative. Twitter war is ugly. Not quite as ugly as the 15th Marine Expeditionary Unit, but an arguably close second. I hate it when mommy and daddy argue. 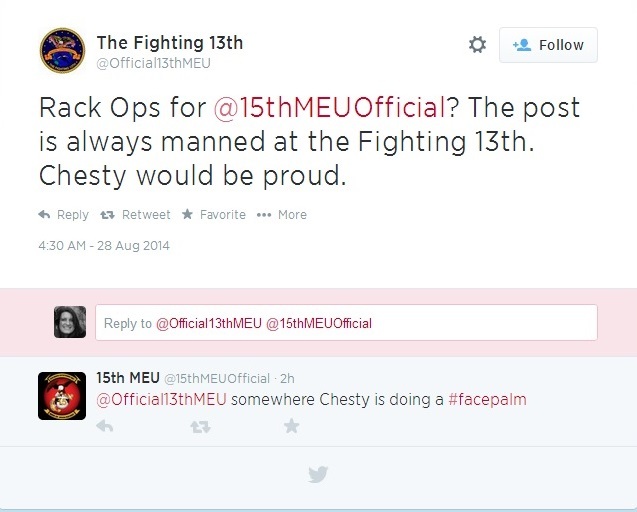 I’m rooting for the 15thMEU in this little feud. 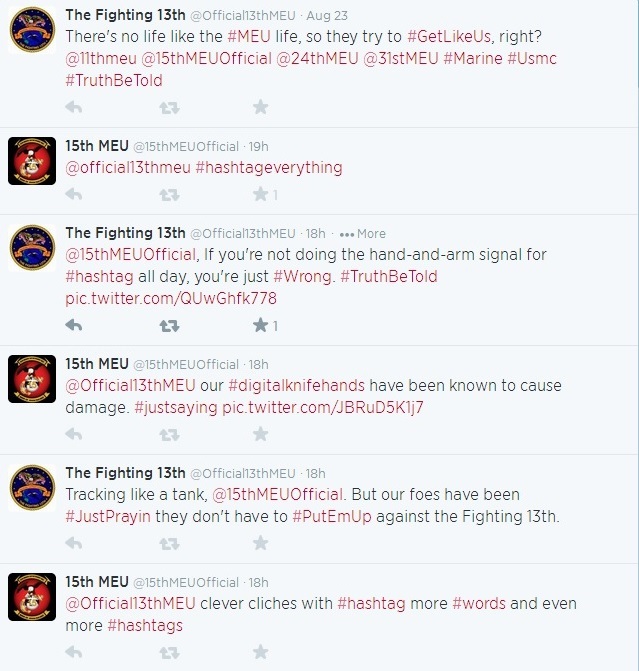 What they are both missing is that the 31st MEU beats them all. Great publicity and Marines can do no wrong in my book. Much love!